I don’t usually post updates of my plugin here; however, I think this release can potentially attract a wider audience. The plugin normally revolves only around a language called progress/open edge, you can learn everything about it here : http://jcaillon.github.io/3P. It can completely replace the default autocompletion of notepad++ (more precisely scintilla) by the one used in 3P. Why replacing the default autocompletion? A noteworthy option is the ability to automatically insert the current suggestion when a non-word-character is typed. This is very similar to the autocompletion offered by the visual studio + resharper combo and allows to write code very quickly. Note : the screenshot is actually obsolete, find more options in the release. I hope this can be useful to you guys; feedback is welcomed ! Damn, can’t edit my own post and I have to wait 1800s to post again ^^"
@jcaillon - This looks great - Thanks! I have a high dpi monitor - the UI of the dropdown list is so tiny, I can hardly see it! Another thing, is the autocomplete plugin tied together with the 3p plugin? Or can I install it without that? There were 2 files in the download, I placed both in the plugins folder. Hi @DaveyD , thank you for the feedback. Concerning your final question : yes, for now, this is tied to 3P. However, I plan to create a separate plugin with only this autocompletion feature once it is mature and stable enough inside 3P. I started testing again this morning - at first it wasn’t triggering at all! I restarted npp, still wasn’t triggering. @jcaillon - After a bunch of testing, I think I found the the problem of the triggering! Start typing - Autocomplete triggers as expected. However, after testing some more, I realized another thing, If I open a new file and then go back to the original file, the autocomplete triggers as expected even on a line that has no text. Thank you for taking the time to analyse this! That default behavior is perfect! No, I was in a file with over 1500 lines of text, I had just placed my cursor on an empty line. Place cursor on line right after text - autocomplete triggers! Open new file in npp and return to previous file - autocomplete everywhere and anywhere! Im so sorry, I see your problem in the video but I still can’t reproduce it! Do you have other plugins installed? Is your file special in any way? I’m clueless at this point ^^"
If that’s not too much too ask, and if you use a portable version of npp, would you mind sending me a copy of your npp installation directory with a sample file of your language? I started debugging - I must have spent 2 hours debugging! Created a new portable npp and installed your plugin - everything worked. Installed all my plugins, everything worked!?? Removed all plugins from my original install - it worked! Began putting all back few by few… I found that it was the python plugin! but that’s odd, because in my new portable npp, I also had python plugin installed and it worked!? I went back to my new portable install, removed all plugins except python. It worked!?? If so, it must be something with my Python plugin in my installed version. I checked it and it was up to date. I copied all my Python scripts from my install into my new portable npp - it still worked!! Anyway, to make a long story short… the bug is due to a setting on Python script! When Python script is set to start startup scripts ATSTARTUP (instead of LAZY), we get this funny behavior. Close npp, reopen, the bug appears. The minute you change file and come back, it begins to work. However, I did realize that it doesnt behave this way with all files! I tried a python script, it worked fine. I tried a regular txt file, it worked fine. I has to do something with the text in my file. For testing purposes, I was able to reproduce this issue with a file of just a few lines. In order to help you find the problem, I am sending you the sample document. I am actually sending you 2 of the same docs with a slightly different name so you can see that immediately after moving to a new file, it begins to work even though the files are identical! If it’s more convenient for you, I also packaged the entire portable npp folder. If you go with this, everything will be setup already (files included, and they will open immediately because of the sesssion file). By the way, I tested this exact method on 2 different machines and got the same results. @DaveyD, thank you very much the time you spent on this issue! 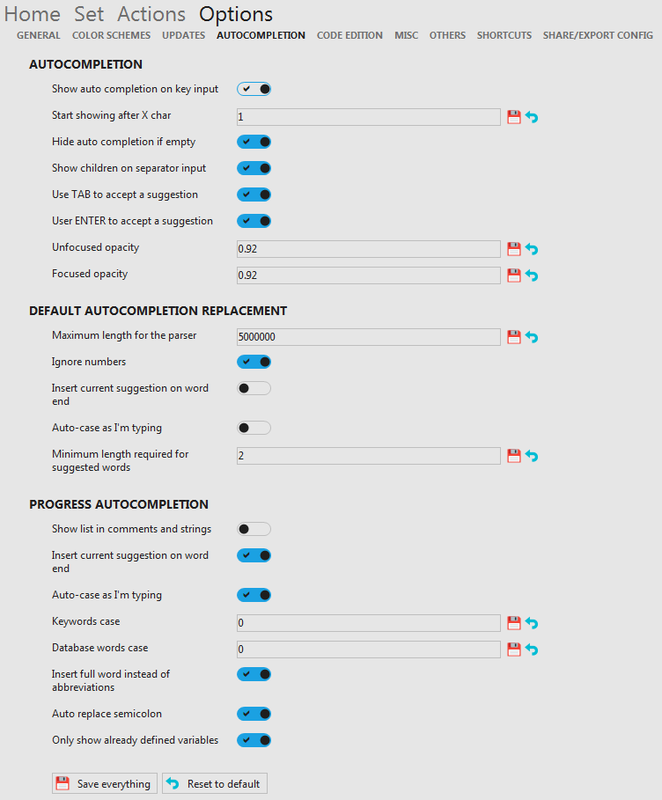 I should be able to fix the DPI awareness for the next release; at least for the auto completion form (I have more complex issues in the main window). After you release that I will hopefully be able use it and to provide much better feedback on the actual plugin. @jcaillon Great work! How did you disable the default auto completion feature?